An artist's rendering of the Philae probe on Comet 67p/Churyumov-Gerasimenko. The probe's landing is now scheduled for Nov. 12, 2014. A European probe is expected to make an audacious landing on the face of a comet tomorrow (Nov. 12), and you can follow it live online starting today (Nov. 11). The European Space Agency's Rosetta spacecraft is currently orbiting Comet 67P/Churyumov-Gerasimenko while speeding through deep space. If successful, the landing will mark the first time humans have soft-landed a probe on a comet. Rosetta is due to release the Philae lander down to the comet's surface on Wednesday, and three different space-focused organizations will host Rosetta webcasts tonight and into tomorrow. You can watch the Philae landing webcasts live on Space.com. NASA will also host a webcast about Philae's landing, on Nov. 12, and the online Slooh Community Observatory will show live views of Comet 67P/C-G during the observatory's webcast after the landing, also on Nov. 12. You can watch the Slooh webcast directly (http://live.slooh.com/), as well. Rosetta will release Philae down to the comet's surface when the two spacecraft are flying about 14 miles (22.5 kilometers) from the "dirty snowball's" face at about 3:35 a.m. EST (0835 GMT). Scientists will find out if the separation of the two spacecraft was successful about 28 minutes and 20 seconds later, once Rosetta's signal reaches Earth. Mission controllers on the ground have picked out what seems to be a relatively smooth landing zone (called "Agilkia") on the craggy comet's face. Once released, Philae will have no ability to maneuver itself midair, but ESA officials should get an update about the comet's progress down to the surface at about 5:53 a.m. EST (1053 GMT), when Rosetta should establish contact with the lander on its way down. Philae's mothership, still orbiting the comet, will then be able to transmit science data and other information about Philae's health to people on Earth. 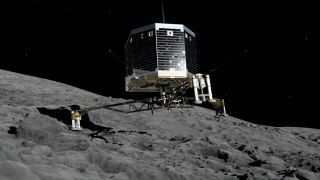 Scientists working with Philae hope that the lander's trajectory will take it to an easy touchdown, but this might involve a little luck, according to mission managers. "The surface of this comet is very, very rough," Andrea Accomazzo, ESA Rosetta flight director, said during the webcast. "It's not the ideal place to land on, but this is what we have, and this is what we're trying to do. We have to be a bit lucky, as well. If the lander hits the surface of the comet in the proximity of a boulder or something like this, then there's nothing we can do." After touchdown, Philae will deploy a harpoon that will keep it in place in Comet 67P/C-G's low gravity. ESA officials will use Philae to take measurements and snap photos on the comet. This will help gather more information about this mysterious type of cosmic body, a leftover from the dawn of the solar system. Rosetta and Philae launched to space in 2004. They flew about 4 billion miles through space before arriving at Comet 67P/C-G in August. The Rosetta mission is expected to continue at least through December 2015.